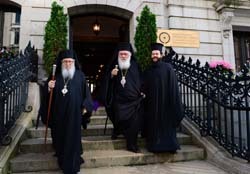 His Beatitude Archbishop Ieronymos of Athens and All Greece visited the headquarters of the Holy Archdiocese of America yesterday morning and officiated at a Doxology in the Archdiocesan Chapel of St. Paul. Present for the visit and service were diplomatic representatives of Greece and Cyprus, and clergy, leaders, and staff of the Archdiocese. “We have received a Hierarch, who with love that has no limits, has applied in full the teachings of the Apostle Paul as a witness of the Orthodox faith and of love,” stated His Eminence Archbishop Demetrios of America in welcoming the head of the Church of Greece to the Archdiocese. His Beatitude stated that he was deeply moved by his reception and experience in America, and he spoke of the mission of the Church in today’s world, especially given the current circumstances in Greece. He stressed that in the face of difficult and unfavorable circumstances we must not be pessimistic. He added that he knows very well the bitterness the people of Greece feel as well as the unexpected and inappropriate conduct of Greece’s partners in the European Union, saying that the great and strong ones sometimes make mistakes as well. “All of us together will do our duty, and God will give us His help to overcome all of these things,” he concluded. At the conclusion of the service, Archbishop Ieronymos greeted each member of the staff of the Archdiocese and gave his blessing to all. Just before noon, His Beatitude, accompanied by Archbishop Demetrios and the Hierarchs and clergy of his delegation, visited the community of St. Demetrios in Astoria. He was greeted by the Proistamenos, the Very Rev. Archimandrite Nektarios Papazafiropoulos, the clergy of the Church, the parish council, members of the school board, and teachers and students of the School of St. Demetrios who presented him with flowers. First, the Archbishop prayed in the Church, and everyone chanted the apolytikion of Saint Demetrios. Following, he toured the School, which includes an elementary and secondary school, and is the only Greek American high school in America. In honor of Archbishop Ieronymos, the students presented a program of songs and traditional dances, which impressed His Beatitude and the members of the delegation. “Now I understand why you insisted on visiting this garden filled with so many flowers,” said His Beatitude to Archbishop Demetrios; and as he began his message to the children he thanked the Archbishop for including the visit to the School in the program. Following the visit to St. Demetrios, Archbishop Ieronymos, Archbishop Demetrios and the members of the delegation attended a dinner in honor of His Beatitude hosted by the Permanent Representative of Greece to the United Nations, Ambassador Michael Spinellis.